Stewart Milne Group has announced that, after 30 years with the group, Chief Executive, Glenn Allison, is retiring in March 2019 and will be replaced by Stuart MacGregor. Mr MacGregor has been working closely with Mr Allison for the last two years, in his position as Chief Operating Officer. 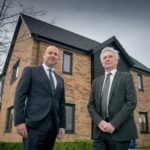 The housebuilder and timber systems manufacturer has a turnover of more than £280m. Mr MacGregor joined the business as Group Finance Director in 2015. He has over 25 years’ experience in business and finance leadership roles, including a successful 15-year career with global brewing giant Heineken, where he worked in several European countries and the UK.